If you want quality and luxury in a brush, you need the Mason Pearson. It may look like an ordinary brush, but I can assure you through my own experience that it’s like a magic wand for your hair. When I first experienced a Mason Pearson I was immediately blown away. I was hooked, and suddenly the cost of the brush didn’t matter anymore. I had to have one. The Mason Pearson brush was invented over 100 years ago in England by an engineer and inventor by the name of, that’s right Mason Pearson. Brushes where still being assembled by hand until Mason invented an automatic brush-boring machine that would speed up the process of making brushes. Soon after that he created the rubber cushion hair brush, and bam the Mason Pearson hair brush is born. Even though Mason invented a machine to help with the process of assembling brushes, the Mason Pearson brush to this day is still made mostly by hand. And to give extra care the brushes are not massed produce to ensure quality and perfection. I’m going to get real with your for a minute. This is not a cheap brush. Ranging from $100 to over $300 the Mason Pearson will make a dent in your wallet, but it’s well worth it. I know stylist who have had their Mason Pearson brush for over 15 years and it’s still going strong. It’s like the saying goes ” You get what you pay for.” If I have learned one thing in my 30 years being on this planet that saying is very true. Kind of how a cheep pair of heels aren’t going to last as long as a pair of Christian Louboutin. Your hair is the one accessory you can’t take off, so give it love, and the best treatment it deserves. It’s always there for you. 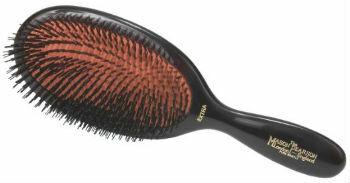 Over time; with consistent use the brush has been known to tame frizz and smooth hair. A wide range of brushes to suit any hair texture. Even brushes made for children’s sensitive scalps! Will most likely be that last flat brush you will need to ever buy. It’s very, very simple. The brushes come in a variety of different bristles. Just pick the type of bristle according to your hair texture. That’s it, easy peazy. Sometimes we all need to treat ourselves, and if your looking to do just that invest in a Mason Pearson. I promise you won’t regret it.